Ronstan is a world-leading manufacturer of sailboat hardware, created through innovative thought and real-world testing. The full range of yacht and dinghy sailing products includes products such as blocks, sheaves, travellers, furlers, rope cleats, stainless steel fittings, sheet and halyard winches and much more. Ronstan’s head office in Melbourne, Australia, is home to state-of-the-art design facilities. The primary manufacturing plant, advanced warehousing and global distribution system, handles more than 4.9 million units each year and is further supported by sales offices in Sydney, Brisbane and Perth. 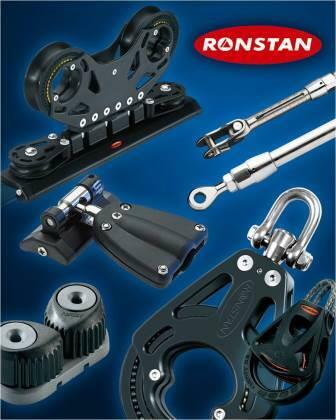 Internationally, Ronstan’s one of the top three sailboat hardware brands in the world, instantly recognised and respected in 45 countries. The passionate team has worked tirelessly to develop export markets, establishing offices and warehouses in the US and Denmark and building strong relationships with distribution partners around the world. No matter whether you are a racing sailor or offshore cruiser, Ronstan’s global team experience allows them to offer the perfect sailing product solution to meet the needs of you and your boat.